Electronically record a students' test then quickly save and select a new student to test from the same window. This will save time when assessing multiple students on one class period. Test upwards of 60 students in 45 minutes or less! Embedded in the scoring report are verbal feedback cues based on their assessment results to provide the student with the necessary information about how to correct their movement pattern. 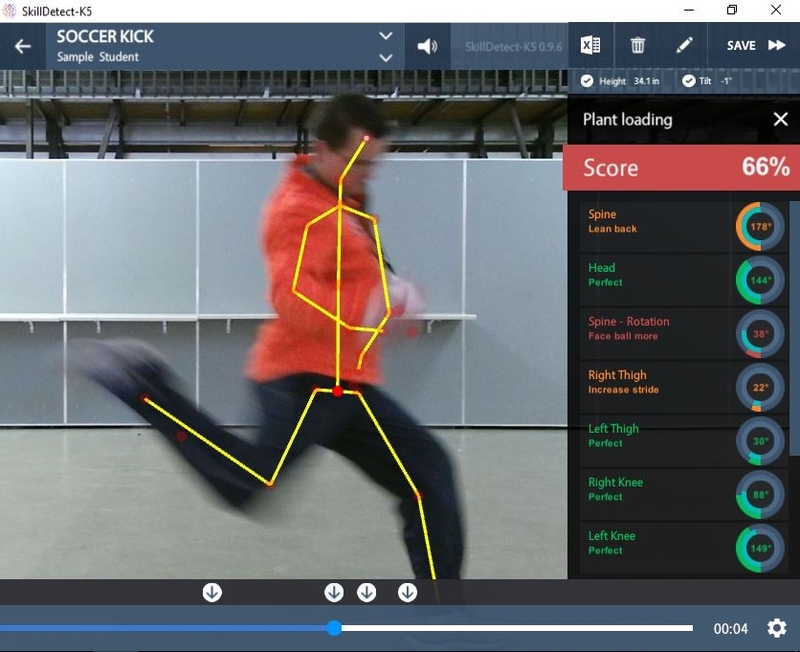 The AssessLinkPE software uses markerless motion capture technology to track students' movements and assesses the quality of their motor skill compared to a biomechanical standard. The markerless 3D sensor is capable of tracking the X, Y, Z, coordinates of 32 joints on the body at 30 frames per second, that's 2,880 bits of joint information streaming into the computer per second. This high level of detail provides AssessLinkPE an unprecedented opportunity to detect nearly every joint movement of a physical education student and assess the quality of their skill. There has long been a debate on how to teach motor skills accurately without burdening the teacher or the student. 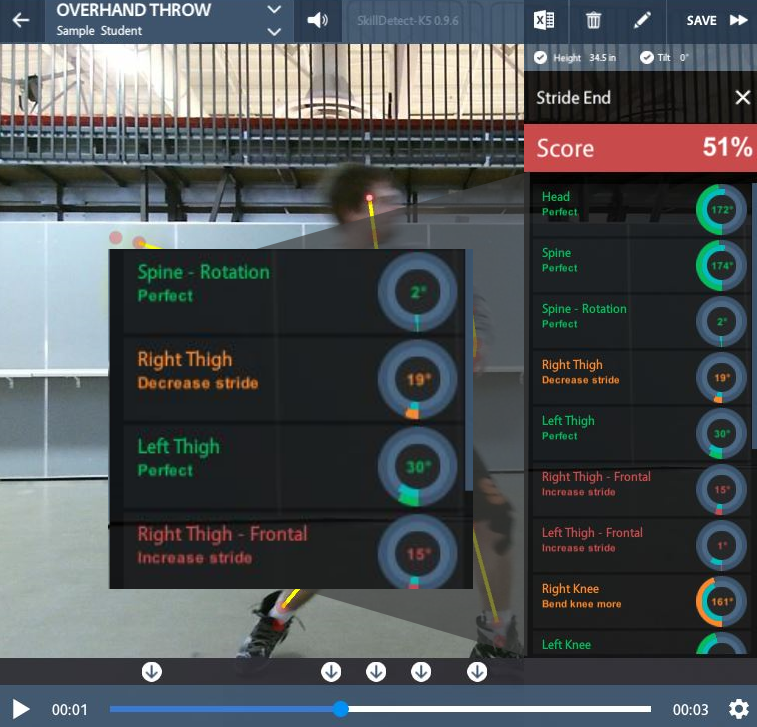 The AssessLinkPE app has taken peer-reviewed research on fundamental motor skills and filtered it down to where a student can be compared to the biomechanical "perfect" movement in seconds. Through the use of temporal phasing the app automatically calculates where one phase starts and another ends. Once phases are identified the body joints are measured and compared to ideal mechanics and score of accuracy is represented in a percentage. Since we know where the errors are, we can then display feedback cues for the student and the educator on where to make adjustments. The Kinect was developed by Primesense, in 2011 as an accessory to the Microsoft Xbox 360. The first version of the sensor totally changed the way 3D motion was captured, requiring no markers on the joints and only cost $299. The second version of the Kinect debuted with the release of the Xbox One system. It was nearly double the accuracy and raised the level of possibilities for development over the first edition of the sensor. The Xbox One Sensor is the sensor currently used by the AssessLinkPE software. Optical motion capture technology has existed in the gaming and film industries since the 1990s. It has also been the cornerstone of modern biomechanics research providing the most accurate 3D models of human movement. This requires the subject to wear reflective markers on their joints that are picked up by an array of infrared cameras measuring these markers' location within the 3D space. Although this is the most accurate method of capturing motion, it is also the most expensive. The software alone for these systems starts at $50,000 and the hardware kits begin around $80,000 for an 8' x 8' space. AssessLinkPE's use of markerless motion capture technology is 98% as accurate as these traditional systems but at a fraction of the cost.